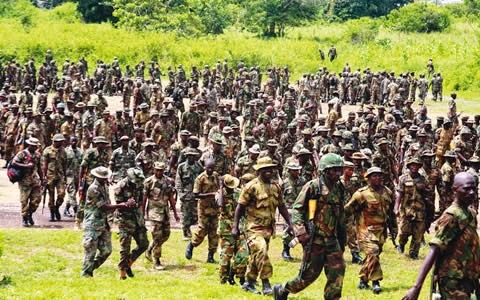 Some 480 Nigerian soldiers have fled into Cameroon following fierce fighting with Boko Haram militants, Cameroon’s army has said according to BBC report. Army spokesman Lt Col Didier Badjek said the soldiers had been disarmed and were now being accommodated in schools. Clashes are said to be continuing in the border town of Gamboru Ngala. Boko Haram on Sunday released a video in which it said it had established an Islamic state in the towns and villages it controls in north-eastern Nigeria. The group’s five-year insurgency has intensified in recent months despite the deployment of thousands of extra troops to the worst-affected areas. Last week, a group of soldiers refused to follow orders to go and fight Boko Haram, saying the militants were better equipped. Insurgents also seized one of Nigeria’s two main police training academies, which is near the town of Gwoza, captured earlier this month.